Hi! I'm Robyn from Create it. Go! and am thrilled to be here at the Silhouette School Blog today. I love Melissa's tutorials and know they have helped me a lot when I have questions about my Silhouette. I have a bit of an obsession with my Silhouette machines and have a secret worry...I'm always afraid that the inside of my house looks like vinyl threw up all over it! Ha! So, someone please tell me if it ever looks that way. For today's post I want to share with you how I took my old front porch rug, that I bought last spring, and used my Silhouette to redesign it, and to give it new life! You don't have to go buy a new one each year...just spend a little time and creativity with what you've got. It's so much fun and I love the way mine came out! Not so cute and fun anymore...lol. But...I liked the same colors, (AND I already had similar colors in my paint stock here at home) so I stuck with a light aqua, green and a dark brown. So, I got started and took some spray paint and painted the whole mat one color to begin with. Then, while it was drying, I began designing what I wanted on my mat. I picked this leaf design from the designs that came with my Silhouette machine. I loved the way it came out...springlike and whimsical. It will act as my stencil so the next thing I did was to cut it out. Now, I cut mine out of vinyl, but honestly it didn't really stick to the prickly-like mat, so you really could even cut it out of paper and just lie it on top as a stencil. I cut mine on my Cameo. It was 12 in by 23 inches. Check out this tutorial for cutting longer than the mat. Next, you just want to spray paint directly over the top of the stencil, so that the paint doesn't go under the sides of the design you cut out. I sprayed green here to paint the leafy stems/plants. It dries rather quickly when using spray paint. After it's dry, you can remove your stencil. I still had a lot of space around the edges of my mat, so I took a piece of cardboard to use as a straight edge and used my brown spray paint to paint a border around the mat. I was almost done! The last thing I did was to add just a bit of white paint here and there to lighten up the mat somewhat and to add a little detail. I just used a white paint pen for this part and it made it super easy and fast. I love using my Silhouette for everyday little things around my house. And love being able to create on a budget with it too! You have so many options with this. You could even paint a monogram on your front door mat, or a welcome greeting, by using your Silhouette to create the design to use as a stencil first. I love being able to personalize our house, inside and out! If you want to check out more of my creations, you're welcome to visit me over at Create it. Go! anytime! What's your favorite project you've used your Silhouette for? I love to hear about what everybody else is creating too! Very cute and it looks relatively easy to bring those dingy things back to life. Ty! This is such a cool spring idea! I'm going to try this on the weekend. Thanks for the tutorial! This is really cool. It would also let you buy a new mat cheaply and fancy it up. (I'm thinking of the ones at Big Lots for $3 or $4). I wonder, though, if the mat does as good a job absorbing water and mud off shoes once it's been spray painted. It seems like the paint would "seal" the mat fibers so they wouldn't be able to. I suppose it depends on where you live and what season it is whether you need a mat that can absorb. Door mats are commonly used mats in homes and offices. 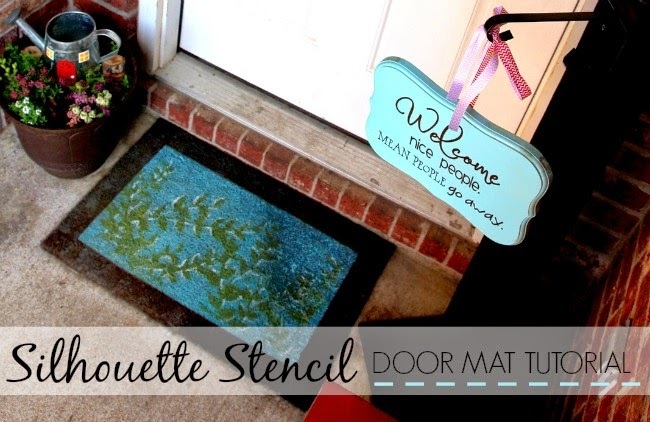 This post is related to door mats and you have shared here very interesting and knowledge with us about these mats.